On this trip we focus almost entirely on the interesting Dragonfly-fauna of Central Sweden with specialities like Blue/Scarce Chaser, Dark/ Eastern Whiteface and the giants among Dragonflies; Hawkers. Among no fewer than 8 species of Hawkers, we find two among Europe´s least distributed Aeshnids; Baltic– and Green Hawker. Add to that a potential list of 4 species of Emeralds, 5 Sympetrids and several Leucorrhinias as well as Damselflies. Among the Butterflies that are still on their wings, Camberwell Beauties are newly hatched and as beautiful as they come, pleasing the cameras. In combination with plenty of interesting Moth-species and leisurely as well as adventurous boat excursions on rivers and lakes, this is a great trip for any Dragonfly- Butterfly– or Moth-freak. We go directly to nearby island Nature reserve Ängsö, where we enjoy a picnic in a deciduous, semiopen landscape with meadows and wetlands and a parklike setting near an old castle. We explore a couple of different parts of this lovely island by foot, looking for Butterflies like Niobe Fritillary and Silver-spotted Skipper and dragonflies like Small Pincertail (Onychogomphus forcipatus) and several Aeshnids. On the way up to the Black River Valley a short stop along a forest track could show some high-summer Fritillaries, like Dark Green– and High Brown Fritillary and (odd years) Arran Browns. Night in the Black River Valley. For those interested we do a Moth-night one or two of these nights, selecting an interesting site where a good selection of Moths are likely to appear. Poplar– and Elephant Hawk Moth, Herald, Pine-tree Lappet, Light Crimson Underwing, and colourful Garden Tigers, Clifden Nonpareil and unique Scandinavian ”Peat-bog Carpet” (Arichanna melanaria) are just a couple of examples on what can be found in late summer. On the west edge of the Black River Valley, lies a vast pineforest – Hälleskogen. With plenty of bogs and mires it is an interesting area to explore on a longer walk. 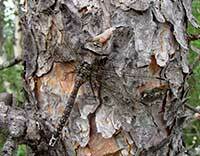 Here we look for Azure Hawkers (Aeshna caerulea), and getting close for pictures might call for the use of snowshoes (!) on the wet bogs. Along – or in fact many times – on the gravel roads Camberwell Beauties often appear and this time of the year they are newly hatched and just as fresh as they get. Always challenging for pictures. As the walk ends we reach a little forest lake were Brilliant Emeralds (Somatoclora metallica) fly and Blue Hawkers (Aeshna cyanea) can be seen among everpresent Brown Hawkers (Aeshna grandis). This is also a good breeding site for Black-throated Divers. 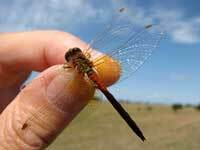 A bit further north we find Keeled Skimmers (Orthetrum coerulescens) in oligotrof forest lakes of the Bergslagen area and maybe Common Goldenrings (Corduelegaster boltonii) are still flying, even if it is a bit late in the season. In the evening we take a relaxed walk to explore the lakesides of Fläcksjön, one of the major lakes in the Black River Valley. Here plenty of dragonflies, e.g. several Sympetrum species, Northern Emerald (Somatochlora arctica) Brilliant Emerald (Somatochlora metallica) and for that sake also birds, can be seen. We await dusk to experience the summerflocks of Common Cranes that roost in the north part of the lake. Well hidden in the pineforests of Roslagen – Uppland, lies a remote, tiny boglake called Mårdsjön. This is a place where rare Dark/ Eastern Whiteface (Leucorrhinia albifrons) flies together with Moorland Hawkers (Aeshna juncea) and Ruby Whiteface (Leucorrhinia rubicundas) and Small whiteface (Leucorrhinia dubia) also can be found. Along the path several species of damselflies can be seen, e.g. Arctic Bluet (Coenagrion johanssoni), Azure Bluet (Coenagrion puella) and Common Bluet (Enallagma cyathigerum), to mention but a few. Not far away we will go by boat up the narrow, slow flowing Kolamoraån to get close to rare Blue/ Scarce Chasers (Libellula fulva) – a species just recently encountered in this area. Night in the Roslagen area. Jälnan is a quite anonymous little, reed-fringed lake in central Uppland, but with a watersurface covered with watersoldier, it´s an excellent site for Green Hawkers (Aeshna viridis), and Baltic Hawkers (Aeshna serrata). They are found together and in the blue border between reeds and meadow, it´s possible to get close to them. If we´re lucky Yellow-spotted Emeralds (Somatochlora flavomaculata) are still flying on the site too. Lake Angarn is another of Uppland´s hotspots för Dragonflies and by a little forest pool we look for Bog Hawker (Aeshna subarctica), along with more plentiful Moorland Hawkers (Aeshna juncea). Back in Svartådalen we check another lake for Northern Emerald and dine on a local speciality that is traditionally eaten just this time of the year – Crayfish! Night in the Black River Valley. 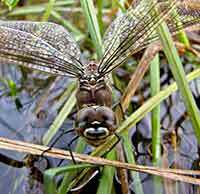 Asköviken is a well-known birding site and also a good site for Dragonflies and Butterflies. An easy walk takes us to an abandoned garden where Purple–, Brown– and White-letter hairstreaks can be seen almost together. At the same time the air is patrolled by Migrant Hawkers (Aeshna grandis) and probably Blue– and Brown Hawkers as well. We walk further down towards the well-grazed lakesides and look through the animals flying around us. Butterflies and Dragonflies are abundant here. When the northern side of the lagoon is ”covered” we move over to the south side where a boat will meet us and take us out for a tour on the big lake Mälaren. In the archipelago White-tailed Eagles and Ospreys breed and in the reedbeds of the Asköviken lagoon Bittern and Marsh Harriers as well as Bearded Readlings are common birds. We lean back on the upper deck, enjoy the view and a tasty picnic lunch as we gaze to the skies for Eagles and Ospreys. Maybe a short swim would appeal if the day is hot. ”Copa despedida” and Barbeque dinner in the hotel garden. The last day we dedicate to what´s on the doorstep, which is a lot of lovely nature in the Black River Valley, including open wetlands, floodplains and pine forests with bogs and many lakes. If there´s anything we would like to se again or if there are species left to see, we have the possibility to encounter Butterflies like Scarce Copper and plenty of Dragonflies in the nearby. Departure for the airport, mid day.